‘Cobra King’ on Rose Barracks in Vilseck, Germany, today. During the Battle of the Bulge the tank and its crew led an armor an infantry column that relieved the 101st Airborne Division at Bastogne, Belgium during the Battle of the Bulge. U.S. Army Europe historians and museum curators recently confirmed the tank’s identity and lineage. VILSECK, Germany — One day after Christmas 1945, “Cobra King” battled its way into World War II history. One day before Christmas 2008, it officially began a new journey to its rightful place as part of the Army’s heritage. Today Cobra King sits overlooking the back gate of Rose Barracks here, a nearly forgotten silent steel hulk. 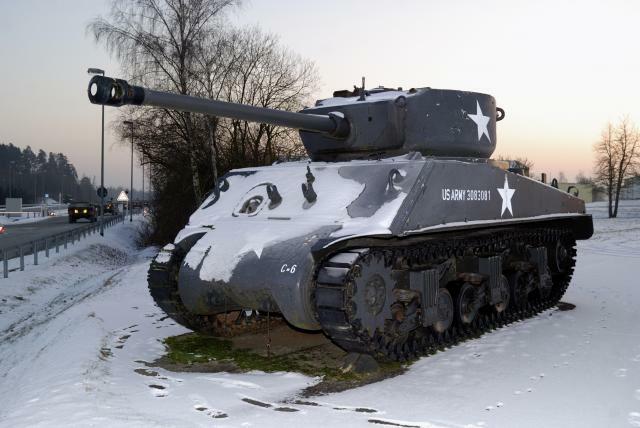 But on Dec. 26, 1945, the same Sherman “Jumbo” tank and its crew led a combined infantry and armor column that relieved Soldiers of the 101st Airborne Division surrounded by the enemy in Bastogne, Belgium, during the Battle of the Bulge. The tank’s moniker comes from the tank corps tradition of naming vehicles with the first letter of their companies’ designations. Cobra King went into battle with tankers from Company C, 37th Tank Battalion. One longtime U.S. Army Garrison Grafenwoehr civilian employee said the tank has been in place at Rose Barracks for at least 10 years. Sgt. Brian Stigall of the 5th Battalion, 7th Air Defense Artillery, said he drove past the tank many times while training on Rose Barracks, but normally paid little attention to it. But after Stigall attended a historical reenactment of the Battle of the Bulge re-enactment, the Jumbo by the base’s back gate suddenly stood out in his mind. A historical marker outside a still-standing bunker on the outskirts of Bastogne displays images of Cobra King that reminded the air defense artilleryman of the tank in Vilseck. After a tour of duty at Fort Bliss, Texas, Stigall said, he returned to Germany and began a mission to track down the vehicle’s history. He started his quest with Steven Ruhnke, the 1st Armored Division museum curator in Baumholder, Germany, who introduced him to U.S. Army Europe staff curator Gabriele E. Torony. Torony knew just who to enlist to get to the bottom of Cobra King’s identity — Charles Lemons, curator for the Patton Museum at Fort Knox, Ky. Lemons is considered the Army’s top authority on tanks, she said. Lemons’ research and expertise shed more light on the background of the Army’s Shermans and unveiled details that suggested the tank in Vilseck might indeed be Cobra King. Cobra King is one of only 254 M4A3E2 Jumbos built by the Fisher Tank Arsenal, starting in June 1944. The first versions of the 42-ton Jumbos carried a 75mm main gun, two 50-caliber and one 30-caliber machine guns. Cobra King was later upgraded to 76mm in 1945, according to Lemons’ findings. The upgrade was ordered by 3rd Army commander Gen. George S. Patton to make Cobra King a more effective anti-tank weapon, Lemons said. “The tank was simply ‘up-gunned’ — a simple process that was done at the order of Gen. Patton in March to April 1945,” Lemons wrote in an e-mail to USAREUR historians…. Go read the rest of this very interesting B*N*S*N story here.